Mmmm looks delicious! I'm a huge fan of brownies, especially those that are a slight twist on the classic recipe. As a fan of the Mint Oreo as well, this seems like the perfect combination of two wonderful sweet treats! Thanks for sharing, I can't wait to give this one a try! And Happy New Year! O_O there's mint oreos?! haven't seen them where i live though :( i'm sure it'll taste good with the normal flavoured ones or with chocolate or strawberry cream..yum! I am going to be making brownies next week - I just hope they look as good as yours! I'm so glad to hear that everything turned out okay in the end! I hope you have a wonderful New Year's babe! These brownies sound wonderful. I'm always up for indulging my intense love of the peppermint/chocolate combo! Xiaolu - so happy to hear that your friend arrived despite the weather! I am sure you had a great holiday... and those brownies - you know my Mom would surely love them - she likes anything with mint and chocolate! I must make them for her while she's here. I'm so happy to hear that your friend will be able to finally make it out. Sounds like you had a really nice holiday as well. I have to admit, I'm not a big fan of mint in my brownies so I might try this out as a non-mint version. I LOVE the new design! Very clean, airy; it draws the eye to your beautiful photography. Your brownies look delicious! Hope you have a great New Year! Unfortunately, I don't think we have mint-oreo here...otherwise, I would be really keen to give this a go... Enjoy your holidays and time with your friend! Yum! I adore those oreo cookies....they make an amazing brownie addition. Beautiful. Just beautiful. So thick too! J'adore! Can't go wrong with brownies! The Oreo addition sounds yummy! Mmmm, these look fantastic! Peppermint plus chocolate is one of my most favorite combos, so this looks amazing to me! These brownies look soooo good! Thanks, everyone! I'm glad you enjoy these and welcome to those of you who're new to my blog. To Shirley and others who don't have access to peppermint Oreos, feel free to substitute normal Oreos or even other sandwich cookies. Or, if you're really dedicated, you could make your own peppermint Oreos using the following recipe and adding 1 1/2 teaspoons peppermint extract to the filling: http://www.mybakingaddiction.com/homemade-oreos/ Hope that helps! Im so happy you had a lovely Christmas, and that your friend is visiting! How special :) These look so delicious - just what my man would love, he goes mad for anything peppermint OR cookies n' cream, so there you go, two in one! Mmm these look delicious! I made something much more simple but along the same lines and I plan on sharing them soon. I'm glad your holiday worked out and you get to see N after all that stress! I like the rustic barrel top? Fab photos! Heidi - Sounds like he would definitely enjoy these. Please let me know what you think if you make them :). Angie - aw you are so sweet! thank you thank you! smalltownoven - I can't see your take on these! warmvanillasugar - I'm glad you like the updates. It's funny how attached I got to the old colors. New York City Girl Expat Abroad - Thanks a lot! It's actually just a large old cutting board but I like it's rustic charm. Irina - Thanks for commenting on the new look. Please do give these a go and let me know what you think! amanda - Glad you're liking what you see. Happy New Year! Xiao, Thank you so much for being one of HomeMadeS readers. I do appreciate your comments. Happy New Year 2011, may the year bring us closer and be friends in harmony. Cheers! That is the most delicius flavoring brownies. Have a wonderful and happy new year to you and yours. I want some with warm milk now though I confess I am not a big fan of peppermint. Have fun with your gal pal next Wed!! Good friends are precious! Happy New Year, Xiaolu! Love the composition though am not a big fan of peppermint! Wish you a wonderful new year ! Those brownies look GORGEOUS and absolutely delicious. Excellent baking and photography! (I commented yesterday but for some reason it didn't appear). I love the flavours of these brownies! Happy New Year! I am not much of a brownie lover, but my gals LOVE this, esp. something with mint in it.Beautiful pictures. Oh you rock the boat sweet Xiaolu... take a look at those brownies! Love the mint in there, and the burst of colour it adds to the browns! Nom Nom Nom!! Happy New Year...and am glad you finally get to meet N!! have fun...and a fabulous 2011! So in love with the green against the brown. Very pretty and i am sure delicious! Wow....your photos just keep getting better and better! I love love love the green!!! Happy new year Xialou and can't wait to see what your blogs brings us this year! Just Cake Girl - glad you like the new design! happy new year, girl! Arfi - thanks for stopping by. it's really been my pleasure to follow your gorgeous photos and recipes. Thanks for being a lovely blogger friend :). Lorraine - thanks and you too! elra - thanks, sweetie! happy new year to you too :). tigerfish - please don't be afraid to try these with other cookies minus the mint. these are really good fudgy brownies even on their own and of course milk is a must! maameemoomoo - aw I'm sorry to hear that. please check out my response above linking a recipe for making your own Oreos if you're up for it. You could also use any other cream filled sandwich cookie in its place :).
? - I understand, but these are good with any cream filled cookies so please don't be afraid to play with other fillings! Nourhan - thanks so much for coming back and commenting again! i really appreciate it and happy new year! Ellie - you too =D! Y - isn't it such an awesome combo? happy holidays to you too babe :). Soma - I certainly hope they like it. Thanks for your kind words, as always! Deeba - you're the sweet one ;p. I did especially like the pop of color. Without it, the photo would have been quite plain! Happy new year, dear! Hannah - thanks, hun! I can't wait to see all the delectable creations you post in the comming year! crustabakes - I'm glad you like it :). I wasn't sure the colors would work, so I'm quite relieved. And of course the taste is dynamite, so I hope you guys give it a try. Lick My Spoon - aw you're making me blush! same to you, and wishing you the happiest new year! Stunning photo as always. And I love brownies with mint. Chocolaty, minty goodness. And so glad to hear your friend is or was visiting. Happy New Year! happy new year! and omg, mint oreos! I would love to try them. These recipes are so good. I especially like those owl cookies. Yumm! These look so amazing!! I love how the crushed up oreos look and it's so fun that the filling is green. Hi Tika! It's just granulated unless I specify otherwise. Hope you like them! These are amazing!! Everyone loved them and they disappeared really quickly! I've added a link back to your site as credit for the recipe - hope thats ok. 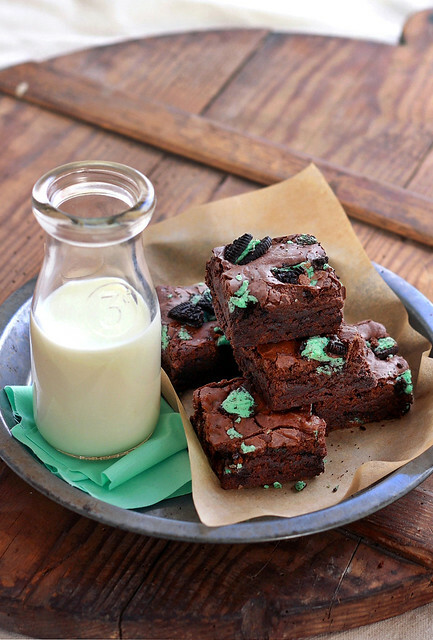 So glad you got hold of mint Oreos and that you got to try/enjoy these brownies! They're a big fav of mine and I make them at least once every few months =). Happy to have your link - thanks!